Antique Emmentaler Cheese for sale. Buy online at Zingerman's Mail Order. Gourmet Gifts. Food Gifts. 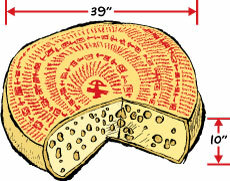 This is the stuff the Swiss eat, cut from 200-pound wheels of cheese. Fantastic for fondue or just for eating as is. Almost a year of extra aging transforms this into an extraordinary example of traditional Emmentaler at its peak of flavor. Due to long aging, it's flavor is deeper, its texture creamier than the standard pre-cut swiss cheese you'll find in the grocery. Exceptional, and very hard to find in the U.S.
Diego, our cheese cave steward, gets a workout with this cheese. At over 200 pounds, it takes two people to crack open a wheel! The flavor is sweeter than previous wheels we've received, and that's a good thing. Smooth, rich and great for eating or on sandwiches. Definitely a winner of a cheese.